Want to learn how to create a redirect test in Google Analytics for A/B testing separate web pages against each other? Knowing which web pages convert the highest is one of the best ways to get more conversions, generate more sales, and pull ahead of the competition. In this article, we’ll show you how to create a redirect test for separate web pages on your WordPress site to see which one resonates the most with your target audience. What is a Redirect Test? 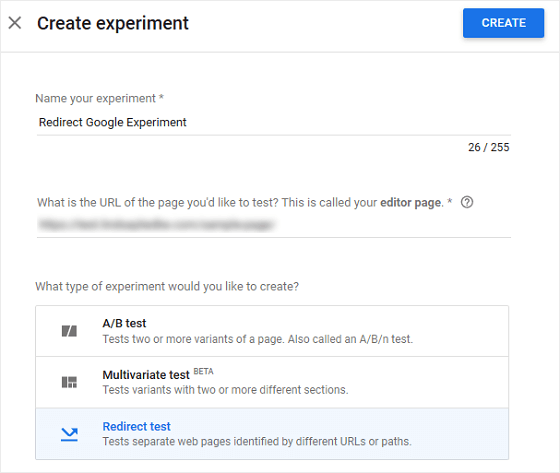 In Google Analytics, a redirect test is a lesser-known Google experiment for A/B testing separate web pages on your website against one another. With this experiment, Google Analytics tracks the URLs of each separate web page, instead of individual elements on one web page, to see which one performs the best among site visitors. 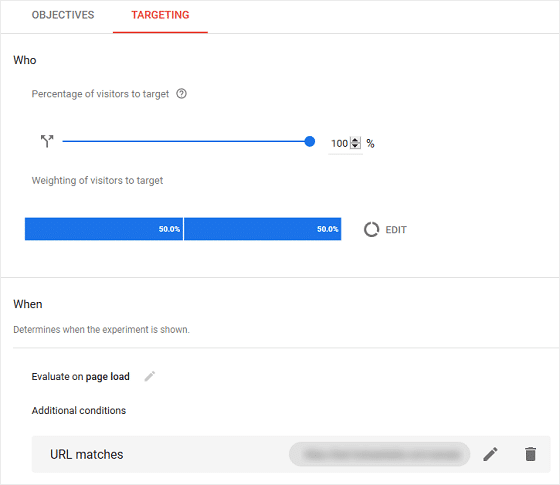 You can create redirect tests using Google Optimize, which is a free A/B testing and personalization platform giving website owners a way to split test individual page elements, web pages, and multiple page elements at once. For us to show you how to create a redirect test for separate web pages using Google Optimize, it’s important you create the two web pages on your website you would like to test against one another. Before getting started with the Google Optimize setup, make sure to install Google Analytics onto your website with MonsterInsights. 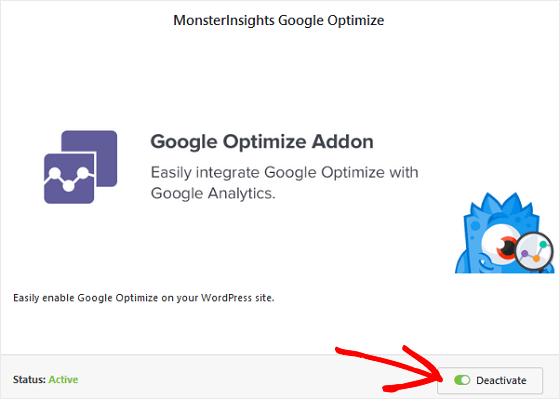 MonsterInsights is the only Google Analytics plugin that lets you connect Google Optimize to your WordPress site so you can conduct hassle-free A/B tests, such as the redirect test. Next, install and activate the Google Optimize addon. For help with this, check out our helpful documentation on getting started with the Google Optimize addon. 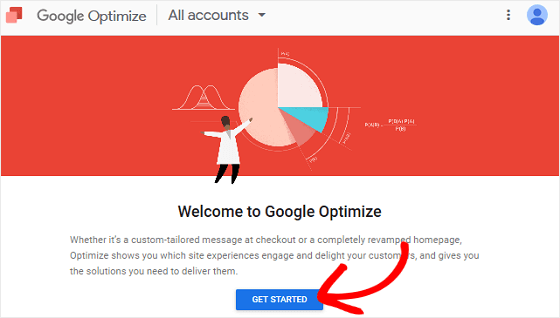 Lastly, if you haven’t already, create a Google Optimize account by going to optimize.google.com. For additional help with this step, be sure to check out our step-by-step tutorial on how to use Google Optimize to run A/B tests on your website. Once you’re in your Google Optimize account, click Get Started. Once inside your Google Optimize account, click on the Create Experiment button. Name your experiment, enter one of the URLs you’ll be testing, and choose which type of experiment you’d like to create. Remember, we’re creating a Redirect Test. 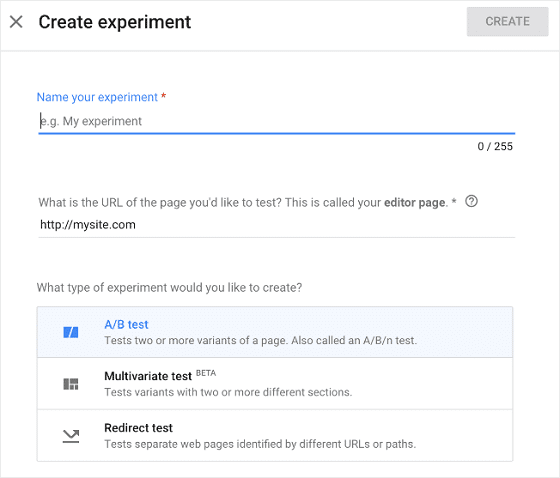 After you create your Google experiment, you’ll need to create your variant, which in our example, will be the web page we’re testing. To start, click Create Variant. You’ll notice that the original URL you put into your experiment is already there. When you do this, a new screen will slide in where you can add the second web page’s URL. You can also name the variant if you want. Notice that your original URL and variant URL are now listed at the bottom of the screen. When you’re done, click Add. Now, under Variants you’ll see both web page URLs and the percentages set at 50% for each. This means that half your site visitors will see one URL, the other half with see the variant. You can change the percentages by clicking on it and editing the variant weight. For our example we’ll leave it at 50/50. 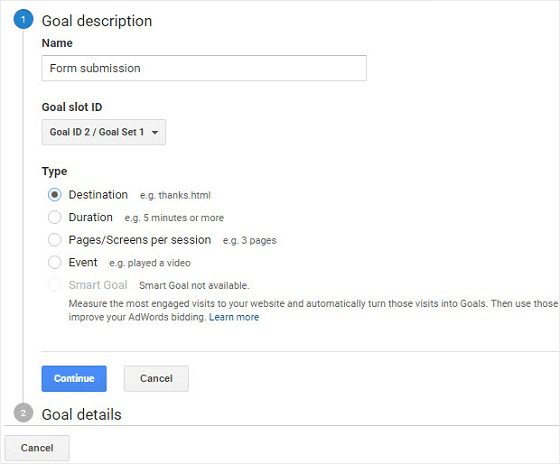 Before starting your redirect test, it’s important you create a goal in Google Analytics to track site visitor behavior on each web page. The goal(s) you create should relate to what you hope to achieve by testing two web pages against one another. For instance, you might track pageviews, bounce rates, form conversions, new user sessions, average duration per session, etc. to see how each web page resonates with site visitors. Scroll down to the Objectives tab. 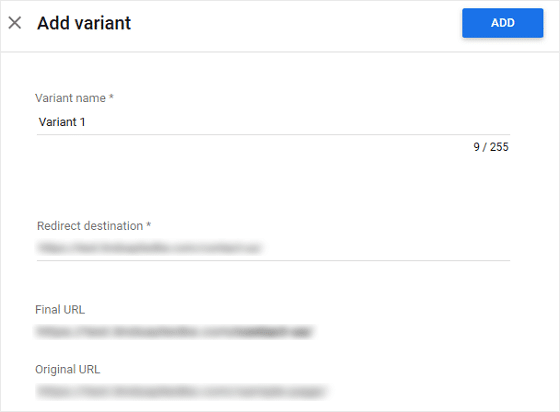 This is where you’ll connect your Google Optimize account to your Google Analytics account so Google Analytics can track your redirect test results. To start, click on Add Experiment Objective. When you do, you can choose from a list of pre-determined objectives or create a custom one. For simplicity, we’ll choose Pageviews from the list. Next, define a hypothesis for your experiment and add a description. This will include information such as what your goal is and what changes you made to reach that goal. You can add additional objectives if you want by clicking Add Additional Objective. Who: percentage of visitors you want to target with your experiment. You can involve all site visitors or choose to have a segment of users not participate. You can also change the weighting of the visitors targeted here too. When: when the experiment is shown to site visitors. For instance, when a page loads, your web pages will show to users. You can also add additional conditions if you want. When you’re all done, look to the top right hand corner and click Save. Then, click on Start Experiment. It’s recommended that you run your Google redirect test for at least 2 weeks before reviewing your results. After you’ve gathered enough data, Google will then declare a winner. And there you have it! You now know how to create a redirect test for separate web pages in Google Analytics. If you want, you can check out WPForms, the most user-friendly contact form plugin on the market today to see how delivering a content upgrade to form subscribers can lead to more conversions. This might be something you want to test on different web pages. For example, one web page might have a simple subscribe form with no content upgrade, and the other might offer a lead magnet like an eBook, exclusive coupon, or handy checklist. From there, you can see which subscribe form gets the most subscribers. And to top it off, you can measure your form conversions using MonsterInsights and the Forms addon.